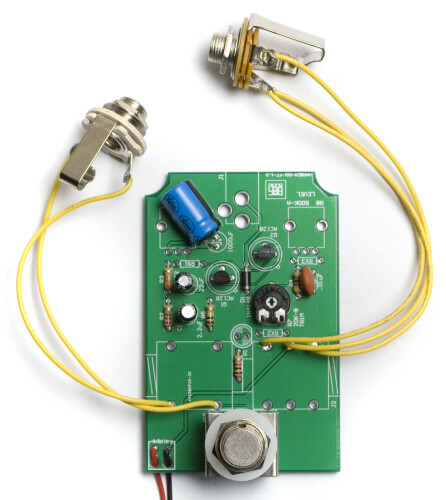 Hello, and thank you for purchasing the Face the Fuzz Wired DIY Kit! This page will walk you through how to build your kit and fit it into a Hammond style 1590BB case. First up are the resistors and Diode. 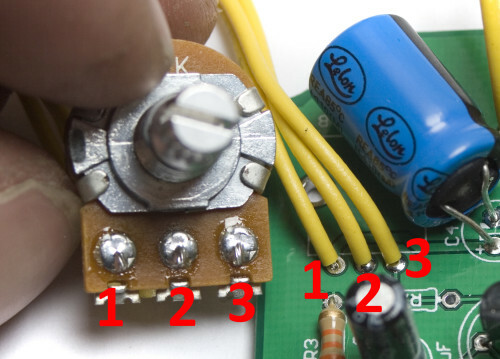 Insert the resistors into their proper places according to the BOM. Then insert the Diode into place with the stripe on the diode facing the same way as the stripe on the board. 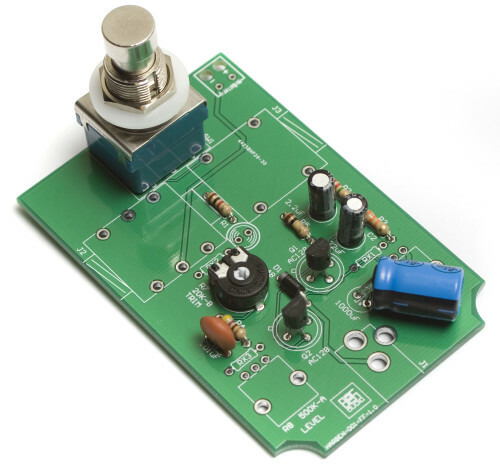 Diodes are polarized components and will not work if installed improperly. 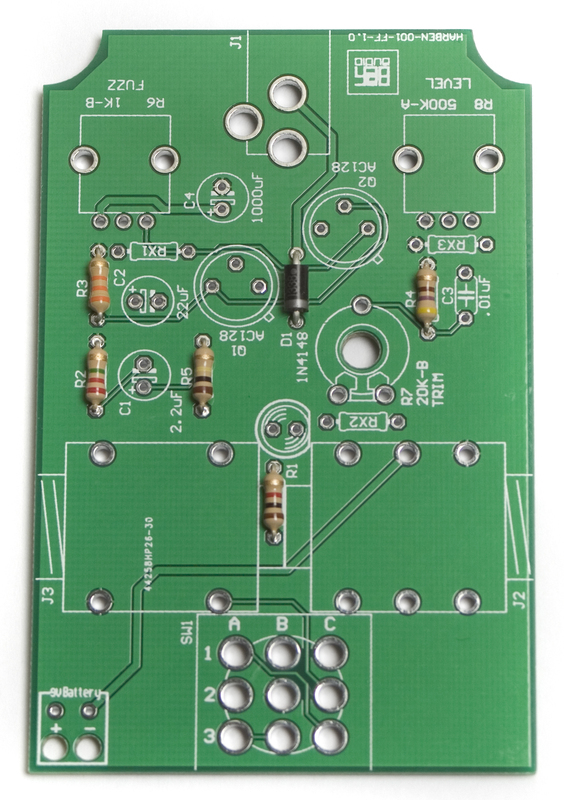 Afterwards, flip your project over carefully onto a flat surface and solder everything in place. Then clip your leads. 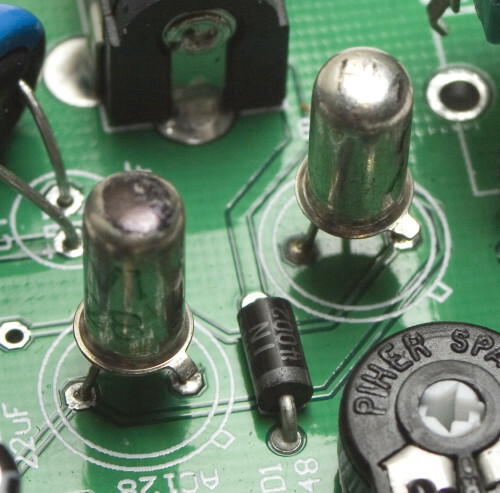 The next things to populate are the transistors. 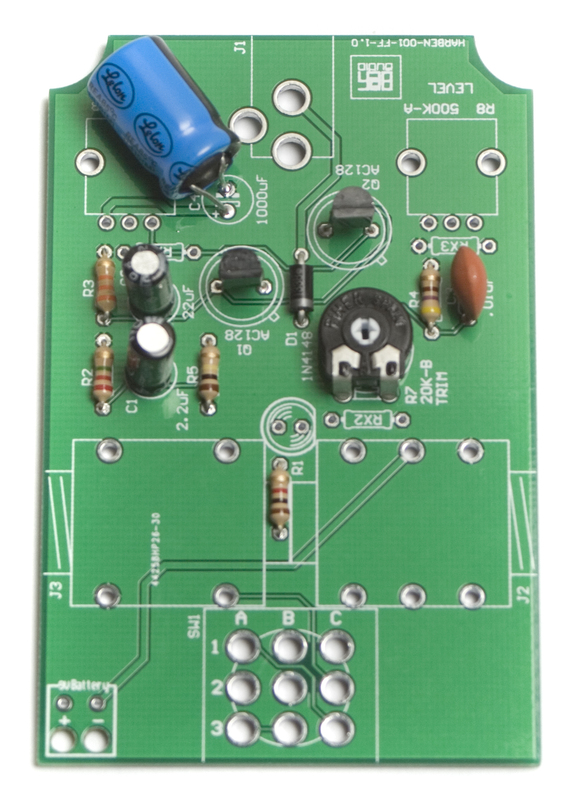 While the Germanium AC128 transistors are the default transistor for this kit, there is also a silicon option, using the BC558 transistor. The picture above shows the proper orientation of the transistors, with the flat side facing the notch in the silkscreen. The picture below shows the proper orientation of the Germanium AC128 transistors, with the notch in the casing lined up with the notch on the silkscreen. 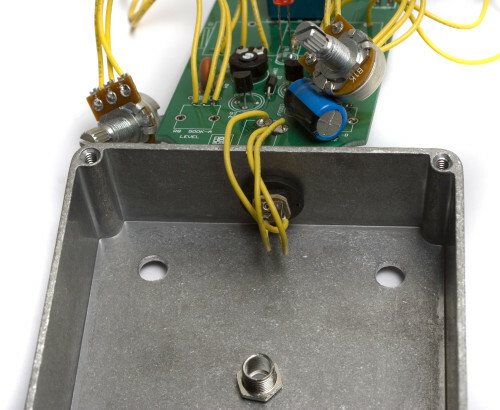 When placing the Germanium transistors, place the one with the Black top (lower gain of the two) into Q1, and the other one into Q2. 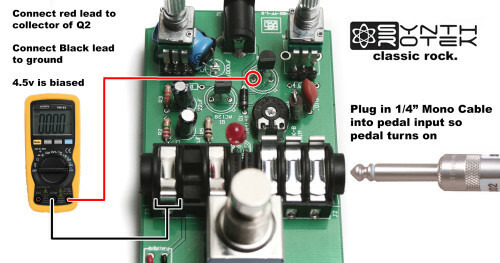 If this is not done, the pedal WILL NOT bias properly. 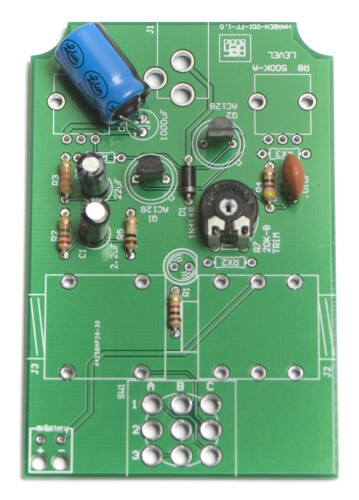 Now we can populate the capacitors into the board according to the BOM. 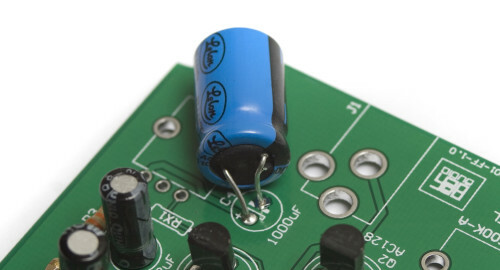 Electrolytic capacitors are polarized, so make sure when placing them, that the stripe on the capacitor goes into the hole opposite from the one marked with a ‘+’ symbol. 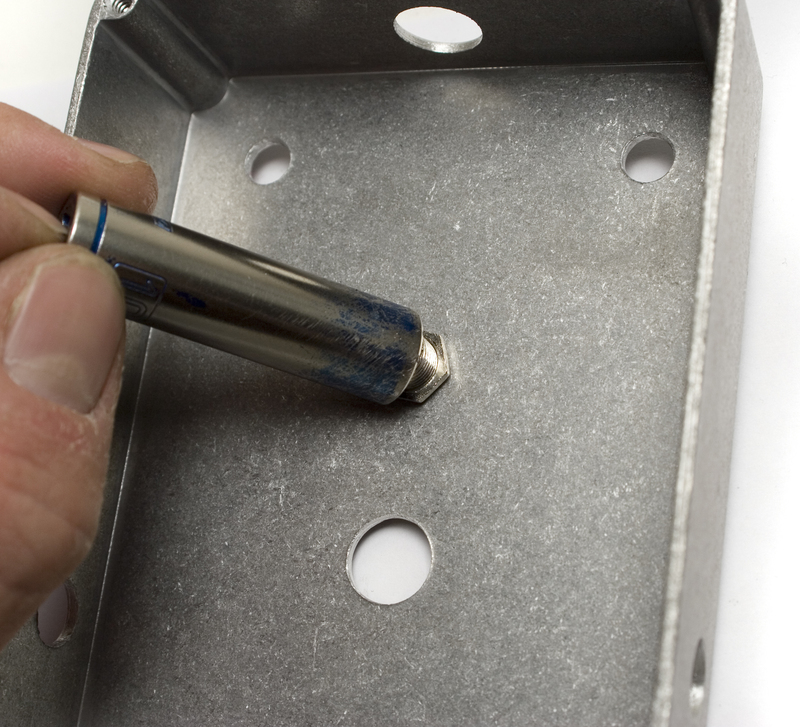 The 1000uF capacitor needs to be laid on its side, as in the photo above for it to fit inside the case. It is easiest to insert it into the holes, then push it over on its side at a diagonal so that it lays flat. Once you have populated all the capacitors, flip it over and solder them, clipping the leads afterwards. 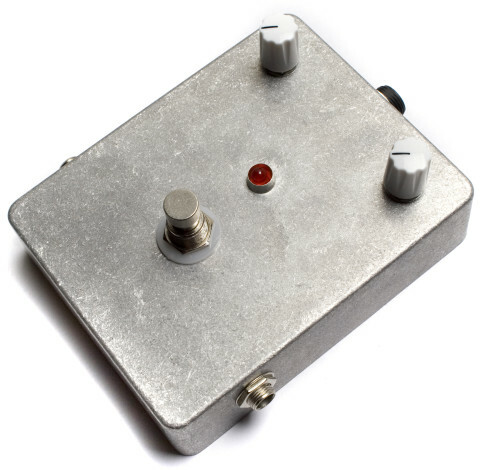 Next up is the stomp switch. Insert it into the designated spot, with the flat sides of the switch facing the ‘front’ and ‘back’ of the board, as shown in the picture above. 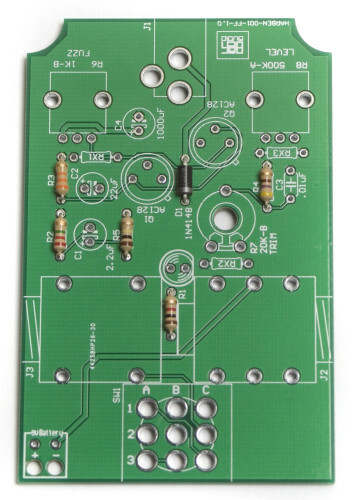 Then flip over onto a flat surface and solder in place. 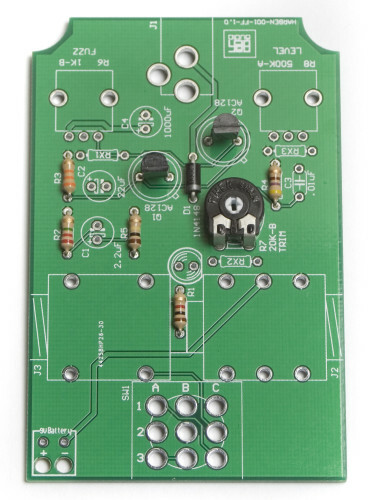 I would recommend only soldering one leg of the switch at first, then checking alignment before finishing the soldering, as de-soldering one of these is VERY difficult without damage to the board. Next we will be soldering all the wired components to the board. This first thing to do is to solder lengths of wire to the components. When Soldering the input and output jacks to the board, make sure to use the proper solder points on the PCB. 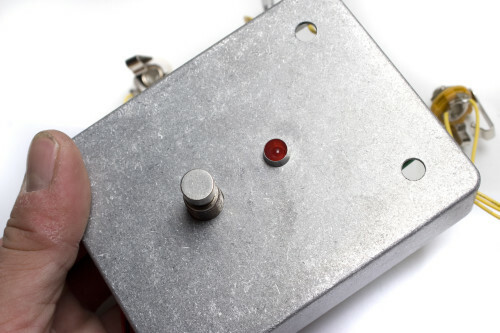 For the Stereo Jack, use the three closest to the trimmer pot, and for the mono jack, use the two closer to the stomp switch. 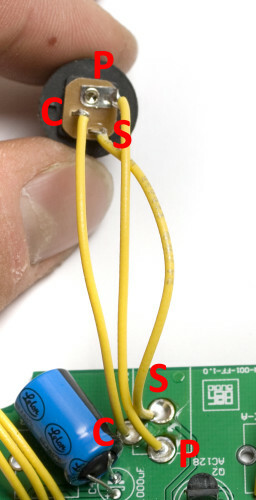 Use these two pictures to double check that you are wiring the jacks up properly. If you instead got plastic jacks, see the very bottom picture. 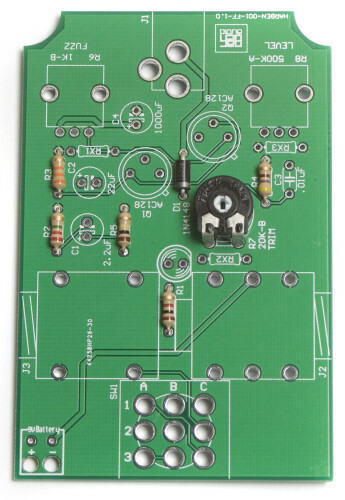 Next solder the potentiometer wires to the PCB, making sure to get them in the proper order, as per the following picture, or they will not work right. The numbering is the same on both sides of the board. 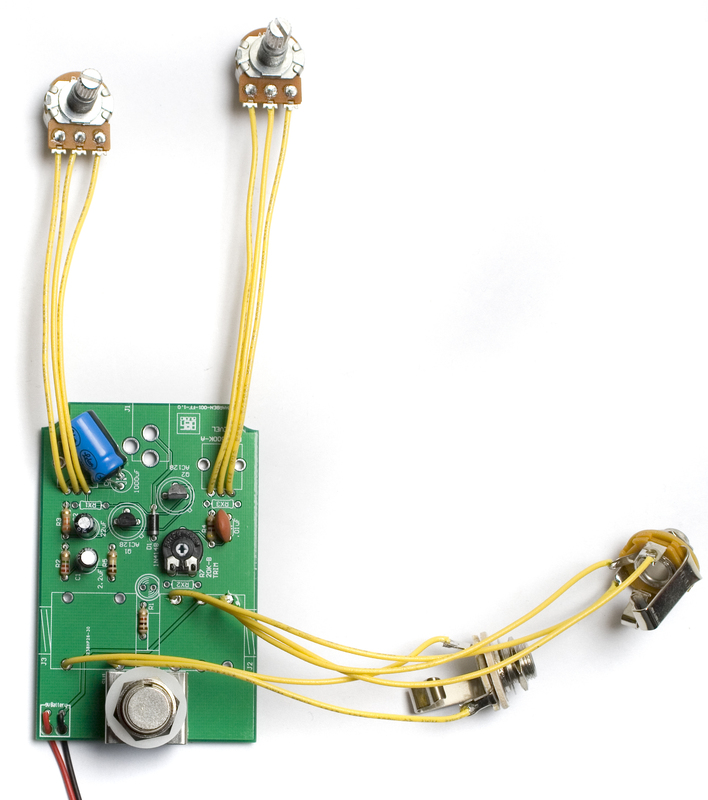 Now we can solder the DC jack wires into their respective holes. 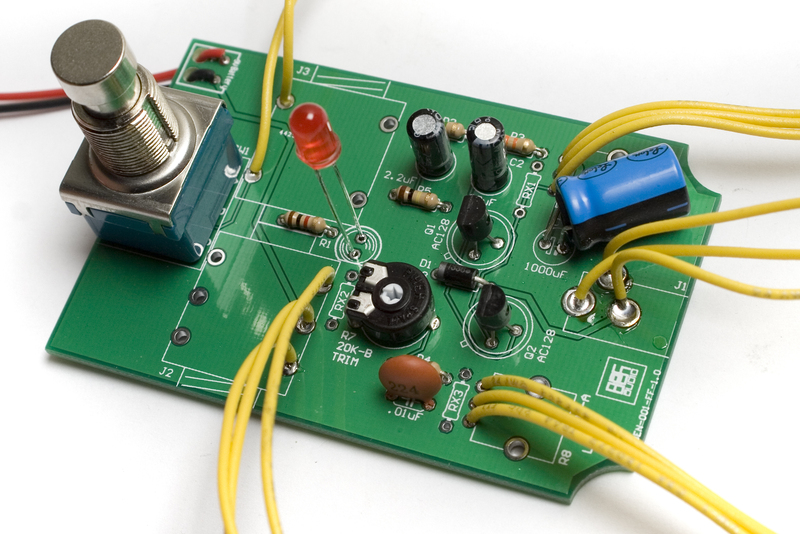 This can be a little tricky, so double check all wires before soldering. We are now ready to prep the enclosure for the pedal. Insert the LED Bezel through the case, and tighten the nut down from the back until snug. Do not over tighten, or something may be damaged. 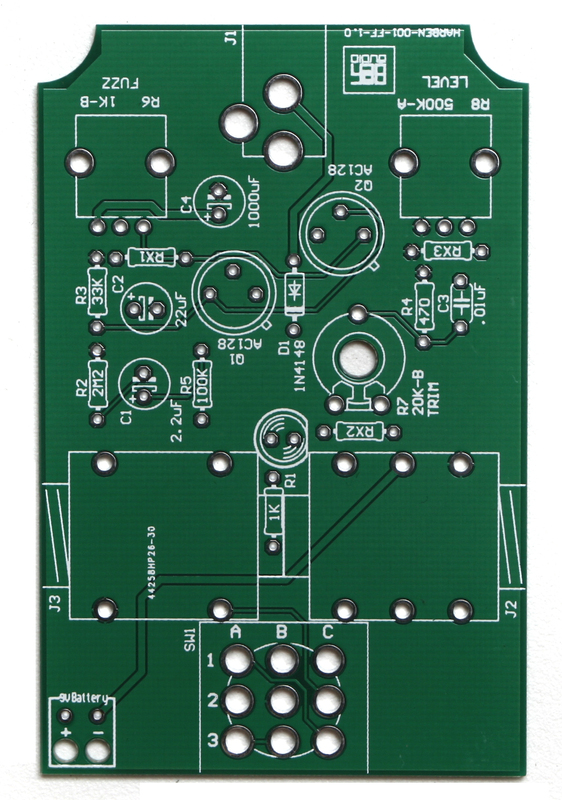 Next, insert the LED into the board, with the shorter leg (cathode) facing the side of the silkscreen that has a flat edge. The LED will also have a flat edge on it to help line it up. DO NOT solder it yet, we need to get the height right first. 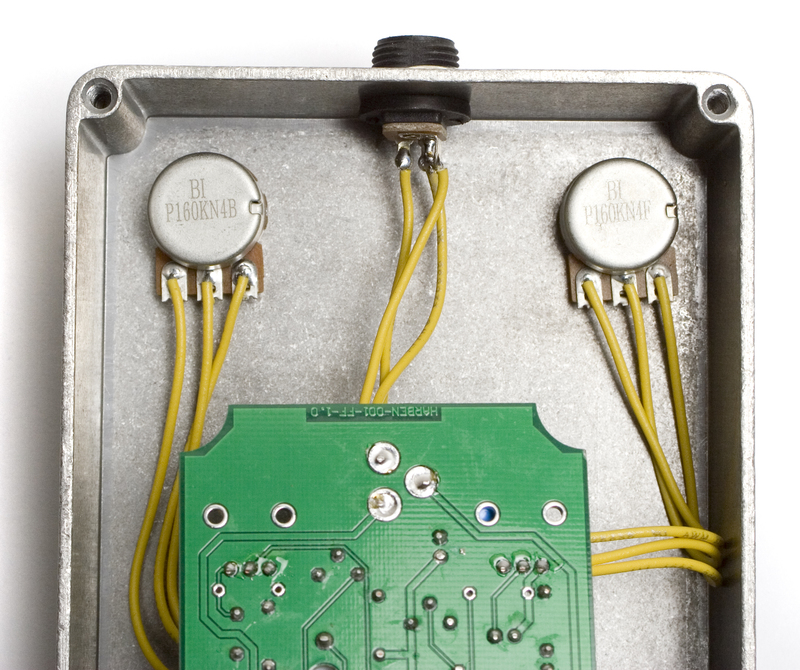 Hold the pedal up to the inside of the enclosure, with the stomp switch going through the hole, like shown above. While doing this, push the LED so that it is visible inside the bezel, like shown in the picture above. 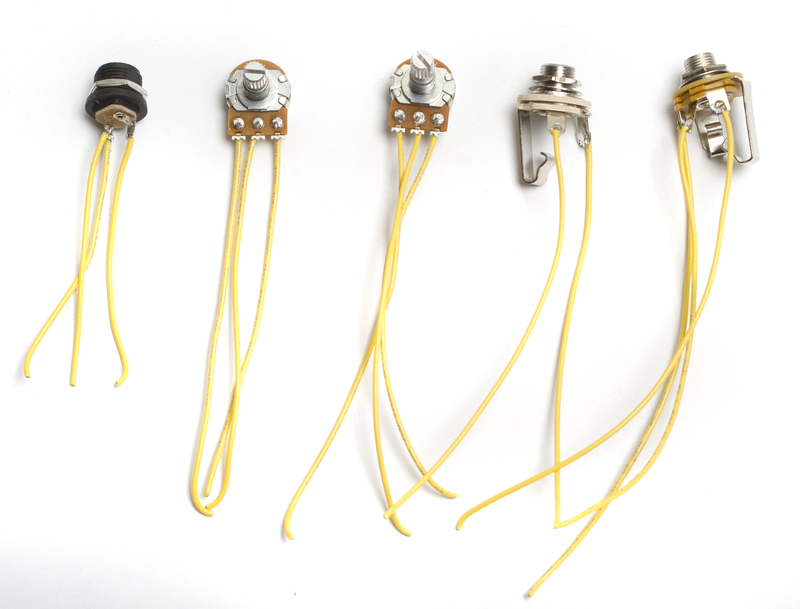 Then bend the leads so that it will stay in place. Flip the project over and solder the LED in place, clipping the leads after. Next, insert the DC jack through the hole at the top of the enclosure, and tighten the nut on the outside. 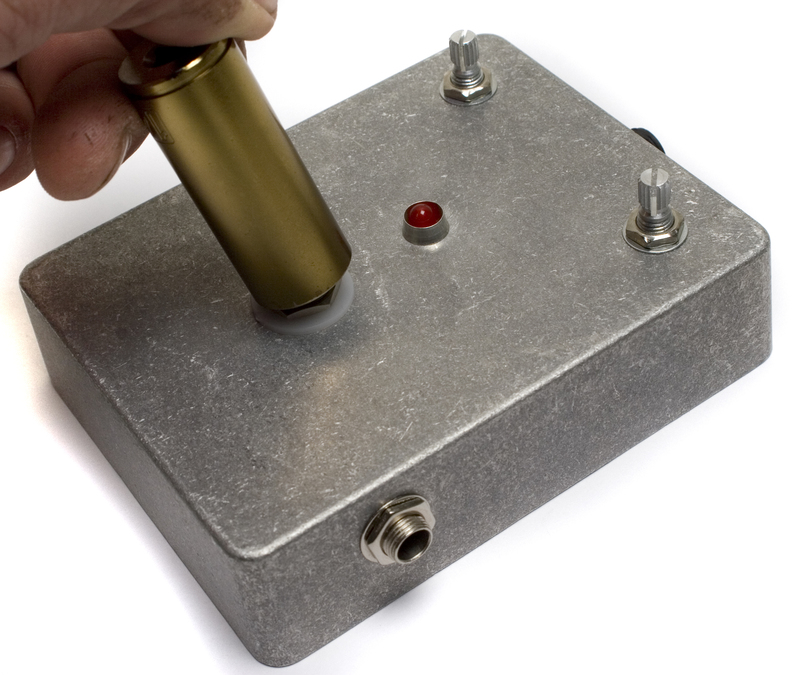 Now we can install the potentiometers in the enclosure. Insert them through their respective holes, and tighten the nuts on the other side. If you wish to use washers, place them on the potentiometers before tightening the nuts, they will prevent the nuts or the tool from scratching the enclosure during install. Next, insert the audio jacks through the holes in the enclosure. Place the washers on the jacks, and hand tighten the nuts on them. It is not recommended to use a tool on these jacks, as they may strip out easily. 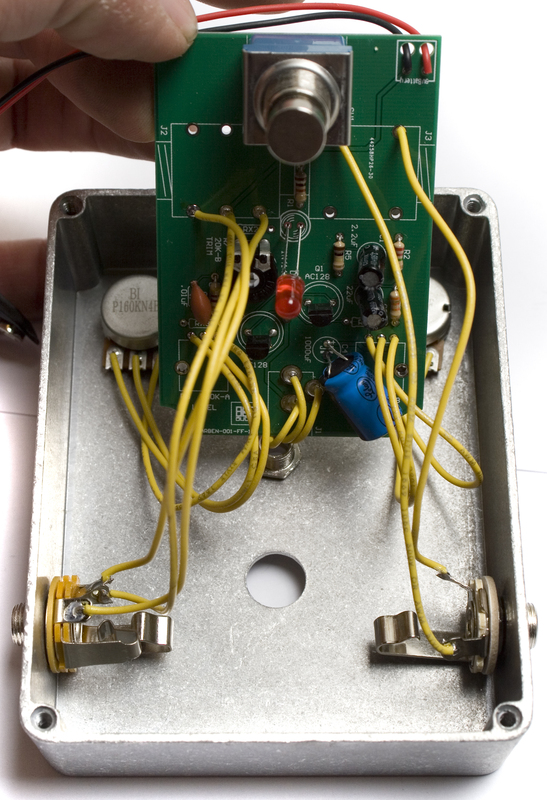 Next, put the board assembly back into place, fitting the stomp switch through its hole, and making sure the LED still lines up. Put the plastic washer down first, and then tighten the nut down on top, securing everything in place. 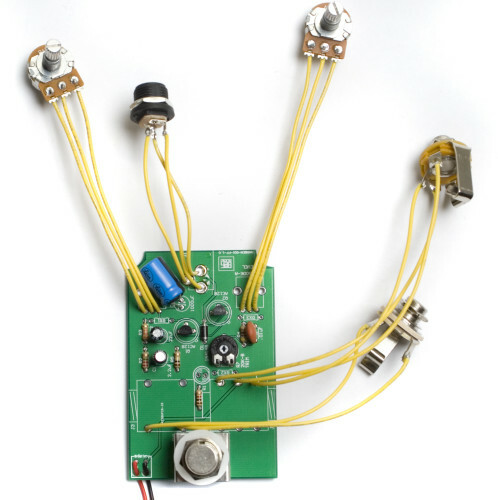 Congratulations on building your Face the Fuzz Wired Version DIY Kit! Trouble with your build? 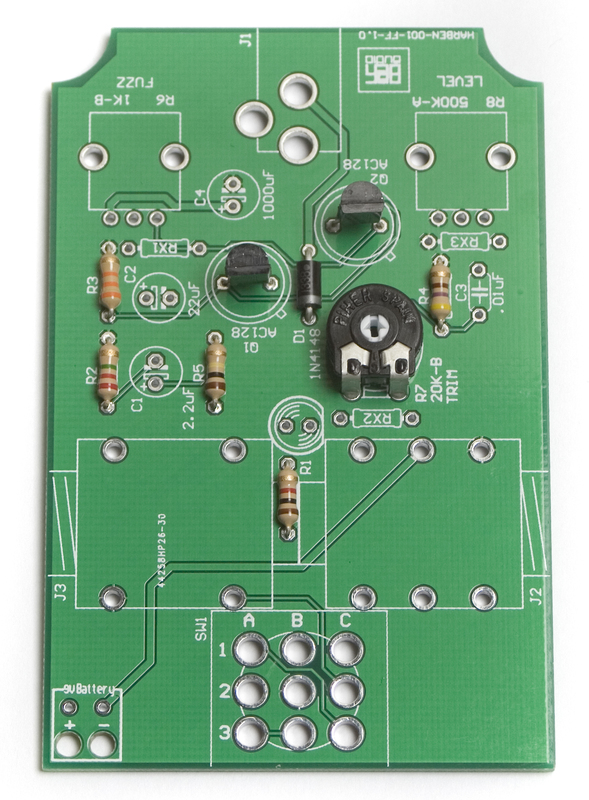 Take a look at our Troubleshooting Guide, it has lots of useful info in there that can help you get your build working right.